Hydraulically driven Universal Material Testpress 120 kN / 150 mm stroke for tensile-, compression-, hardness and technological tests of all kind. Machine is equipped with fast and highly resolving electronic measure systems for force and travel and with electrically controllable actors. The inbuilt intelligency is operated from the touchscreen or the serially connected PC. Singular is the Video Measure System for Contraction. It allows the visualisation of the testspecimen , the measurement of the traverse contraction and the displaying of the „true“ stress during test run. Also image dokumentation in protcol is possible. 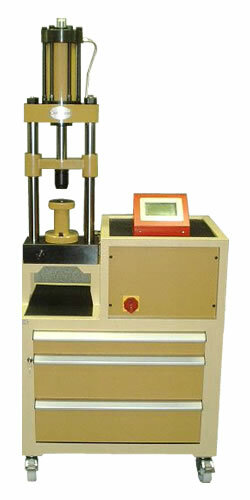 Machine is available in table and compact version and can come with a huge selection of tools. For more details visit www.oehlgass.de.